Differentiation is providing superior value to customers at a profitable price. If we look at the fundamental equation of business (Figure 1), differentiation may be thought of as increasing value through some combination of more or better benefits or a reduced price. Benefits include product and service performance, but also include availability, image, relationship, and many other performance attributes. Price includes the price charged for the product and service, but also includes terms, total cost in use, paperwork required to complete and track the exchange, and other attributes. Any decrease in price attributes or increase in benefits will increase value. At the commodity level — with no differentiation — the return to the business is the cost of capital. All expenses are paid and investors receive a minimal return on their investment, but there is no profit. Differentiation is a win-win scenario. It improves the profitability and viability of business by creating additional value beyond the commodity level of performance, and it delivers superior value to customers through the creation and delivery of high value products and services. Value can also be captured through a lower price. A business with a cost advantage — in raw material, delivery, labor, or other production cost element — can choose to pass along those advantages in the form of a lower price. This can be done without sacrificing a reasonable return on capital. However, particularly in a fragmented industry, unknowing competitors can quickly duplicate price without the corresponding cost advantage and eliminate any differentiation. Successful differentiation requires constant monitoring to ensure that the business has an accurate and current understanding of customer and market needs. Michael Porter was the first to popularize the industrial economic theory of industry structure. Porter’s Five Forces (Figure 2) model remains an excellent way to analyze marketplace dynamics. This diagram uses the model to categorize the advantages of differentiation. Within the cluster of competitors, the differentiating firm has a product or service that is difficult to imitate. Over time, they have built an organizational capability in support of their products that further prevents competitors from encroaching on their monopolistic position. Buyers have reduced leverage against the firm because they have reduced choice and, perhaps, no choice if the product is completely differentiated. Because of their high levels of loyalty and satisfaction, buyers have little incentive to go elsewhere and lessened ability to threaten to do so. Similarly suppliers have limited leverage since the differentiating firm can pass through price increases. Often, the supplier has developed a special or customized material for which there are limited outlets beyond the firm. Again, their negotiating leverage is greatly reduced. 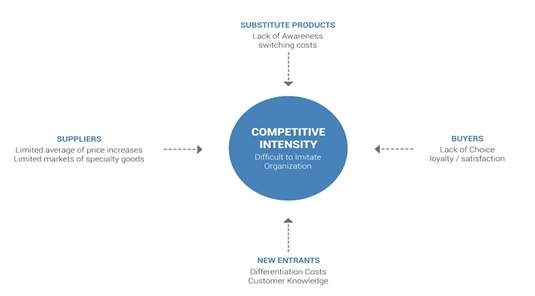 New entrants must overcome not only the common or traditional costs of establishing a business in the market space, but they must also take on the costs of differentiation, which may be significant. In addition, they do not have the knowledge of the customer that is prerequisite to establishing successful differentiation. Finally, substitute products face the barrier of high switching costs out of the differentiated incumbent and into their product, assuming that the customer even has the base level awareness that the option exists. So, the differentiating firm not only achieves a higher profit level, in the process they erect barriers to competition from all sides, reinforcing their position. The Boston Consulting Group has developed a matrix that distinguishes particular market conditions and the resulting differentiation opportunities. In some stalemated sectors, the opportunities are few and the potential benefits are small. The steel industry is one example where there are relatively few opportunities to differentiate and the potential benefit is small. Consequently, more effort is placed on availability through the use of mini-mills and price through controlled imports of certain grades of steel sheet or converted product. In many high volume markets, the opportunities remain few, but the potential gain is large. The packaging industry is one example where an improvement such as light-weighting a bottle is one of a relative few improvements, but multiplied by billions of bottles a year, the benefit potential to the producer, bottler, brand owner, and retailer can be substantial. 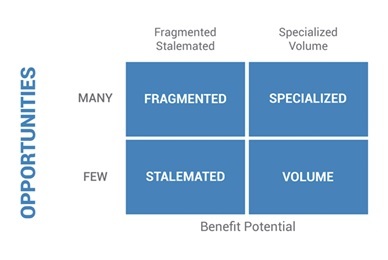 In fragmented markets, there are, by definition many opportunities for improvement and differentiation, but because no business has the scale to manage the implementation of the opportunity, the benefit potential is small. Injection molding is highly fragmented, and there are countless opportunities to differentiate almost any injection molded product — such as butter tubs or make-up compacts. However, the benefit potential is small since a differentiated product will be available to only a few customers. In specialized markets, the environment is ripe for differentiation. Since businesses have already established target segments, an improvement will quickly be translated into customer value. Medical devices and electronic testing equipment are two examples. But it’s not enough just to be different. 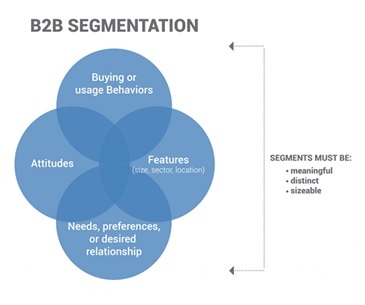 Differentiation and segmentation are two sides of the same coin. The goal is to be the right kind of different, at the right time, and to let the right people know about it. Just being different is not a winning strategy. All markets have segments of buyers. They may be broken out by the way in which they use the product, the frequency with which they use the product, or a hundred other ways. In most markets, there are a sizable number of competitors all trying to reach these customers. Some of these competitors push their products to all customers without regard to their particular needs or behavior. Other competitors try to be more targeted, but with limited information, they end up missing the target — occasionally getting lucky and hitting something. It's like trying to throw darts blindfolded. There are few businesses that thoughtfully segment a market, identify their targets, and then differentiate to go after those targets specifically. This is the essence of marketing. Product includes actual physical differences as well as perceived differences acquired through advertising or experience. 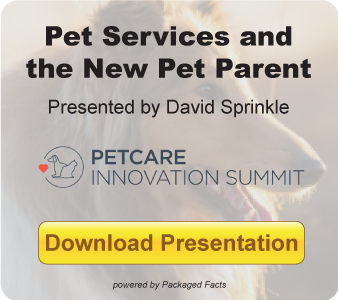 Service also includes actual differences — such as faster delivery or superior design capabilities — but also perceived advantages that may not be substantiated by empirical data. The category of relationships includes not only personal relationships but corporate commitment to the industry through continued investment in production capacity and ongoing product development. In examining our database of hundreds of studies in B2B markets, one of these areas of differentiation is consistently more powerful than any of the others — by a huge margin. We will reveal and discuss “Winning Differentiators” in our next blog. Interested in learning more about creating viable strategies for your business? Check out MarketResearch.com's free eBook "How to Use Market Research to Launch Your Business."